WHEN I GET UP IN THE MORNING FIRST THING I DO IS READ THE NEWS AND THE DAY IN HISTORY ON MY LAPTOP. EVERY MORNING. TODAY I WAS READING ABOUT THE DEVASTATING EARTH QUAKE IN CHINA AND OTHER PIECES OF NEWS AND THEN I SWITCH TO THE DAY IN HISTORY BROUGHT TO YOU BY THE HISTORY CHANNEL. SO JUST WHAT HAPPENED TODAY IN THE PAST THAT IS IMPORTANT AND PART OF OUR HISTORY. WELL THE MAIN STORY IS THAT 204 YEARS AGO LEWIS AND CLARK DEPARTED ON THE CORPS OF DISCOVERY ON THIS VERY DAY MAY 14. SO FOR MISS APONTE’S CLASS WHO IS CREATING A MOVIE ON THIS SACAJAWEA HERE IS THE ARTICLE. 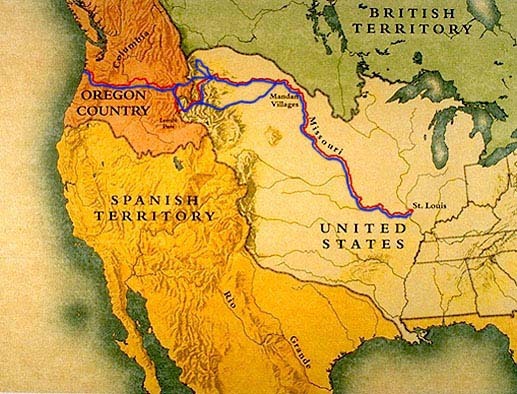 May 14: General Interest 1804 : Lewis and Clark depart One year after the United States doubled its territory with the Louisiana Purchase, the Lewis and Clark expedition leaves St. Louis, Missouri, on a mission to explore the Northwest from the Mississippi River to the Pacific Ocean. Even before the U.S. government concluded purchase negotiations with France, President Thomas Jefferson commissioned his private secretary Meriwether Lewis and William Clark, an army captain, to lead an expedition into what is now the U.S. Northwest. On May 14, the “Corps of Discovery”–featuring approximately 45 men (although only an approximate 33 men would make the full journey)–left St. Louis for the American interior. The expedition traveled up the Missouri River in a 55-foot long keelboat and two smaller boats. In November, Toussaint Charbonneau, a French-Canadian fur trader accompanied by his young Native American wife Sacagawea, joined the expedition as an interpreter. The group wintered in present-day North Dakota before crossing into present-day Montana, where they first saw the Rocky Mountains. On the other side of the Continental Divide, they were met by Sacagawea’s tribe, the Shoshone Indians, who sold them horses for their journey down through the Bitterroot Mountains. After passing through the dangerous rapids of the Clearwater and Snake rivers in canoes, the explorers reached the calm of the Columbia River, which led them to the sea. On November 8, 1805, the expedition arrived at the Pacific Ocean, the first European explorers to do so by an overland route from the east. After pausing there for the winter, the explorers began their long journey back to St. Louis. On September 23, 1806, after almost two and a half years, the expedition returned to the city, bringing back a wealth of information about the largely unexplored region, as well as valuable U.S. claims to Oregon Territory. Sacagawea was born into a Lemhi (“Salmon Eater”) tribe of Shoshone between Kenney Creek and Agency Creek, near what is now the town of Tendoy in Lemhi County, Idaho. However, when she was about twelve years old, she and several other girls were kidnapped by a group of Hidatsa in a battle that resulted in the death of four Shoshone men, four women and several boys. She was then taken to a Hidatsa village near the present-day Washburn, North Dakota. At the age of about 13 years old, Sacagawea was taken as a wife by Toussaint Charbonneau, a French trapper living in the village, who had also taken another young Shoshone named Otter Woman as a wife. Charbonneau is said to have either purchased both wives from the Hidatsa, or to have won Sacagawea while gambling. Sacagawea was pregnant with her first child when the Corps of Discovery arrived near the Hidatsa villages to spend the winter of 1804-1805. 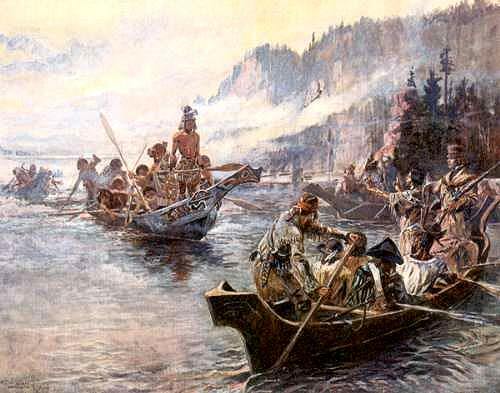 Captains Meriwether Lewis and William Clark built Fort Mandan and interviewed several trappers who might be able to translate or guide the expedition further up the Missouri River in the springtime. They agreed to hire Charbonneau as an interpreter when they discovered his wife spoke the Shoshone language, as they knew they would need the help of the Shoshone tribes at the headwaters of the Missouri. Charbonneau and Sacagawea moved into the fort a week later. Lewis himself assisted at the birth of Jean Baptiste Charbonneau on February 11, 1805, administering crushed rattlesnake rattles to speed the delivery. The boy was called “Little Pomp” or “Pompy”, meaning “first-born”, by Clark and others in the expedition. In April, the expedition left Fort Mandan and headed up the Missouri River in pirogues, which had to be poled and sometimes pulled from the riverbanks. On May 14, 1805, Sacagawea rescued items that had fallen out of a capsized boat, including the journals and records that Lewis and Clark were keeping. The corps commanders, who praised her quick action on this occasion, would name the Sacagawea River in her honor on May 20. By August 1805 the corps had located a Shoshone tribe and was attempting to trade for horses to cross the Rocky Mountains. Sacagawea was brought in to translate, and it was discovered the tribe’s chief was her brother, Cameahwait. “one of the Indians had on a roab made of 2 Sea Otter Skins the fur of them were more butifull than any fur I had ever Seen both Capt. Lewis & my Self endeavored to purchase the roab with differant articles at length we precured it for a belt of blue beeds which the Squar—wife of our interpreter Shabono wore around her waste…. When the corps reached the Pacific Ocean at last, all members of the expedition—including Sacagawea and Clark’s black manservant York—were allowed to participate in a November 24 vote on the location where they would build their fort for the winter. In January, when a whale’s carcass washed up onto the beach south of Fort Clatsop, she insisted upon her right to go visit this great wonder. On the return trip, as they approached the Rocky Mountains in July of 1806, Sacagawea advised Clark to cross into the Yellowstone River basin at what is now known as Bozeman Pass, later chosen as the optimal route for the Northern Pacific Railway to cross the continental divide. Charbonneau and Sacagawea spent three years among the Hidatsa after the expedition, before accepting William Clark’s invitation to settle in St. Louis, Missouri in 1809. They entrusted Jean-Baptiste’s education to Clark, who enrolled the young man in the Saint Louis Academy boarding school. A few months later, fifteen men were killed in an Indian attack on Fort Lisa, located at the mouth of the Bighorn River. John Luttig and Sacagawea’s young daughter were among the survivors. Some say Toussaint Charbonneau was killed at this time; others say he signed over formal custody of his son to Clark in 1813. “An adoption document made in the Orphans Court Records in St. Louis, Missouri states that “On August 11, 1813, William Clark became the guardian of “Tousant Charbonneau, a boy about ten years, and Lizette Charbonneau, a girl about one year old.” For a Missouri State Court at the time, to designate a child as orphaned and to allow an adoption, both parents had to be confirmed dead in court papers. It is not believed that Lizette survived childhood, as there is no later record of her among Clark’s papers.